I was born in the wrong era. This is something I’ve been told before. It’s 100% accurate when it comes to my musical selection. 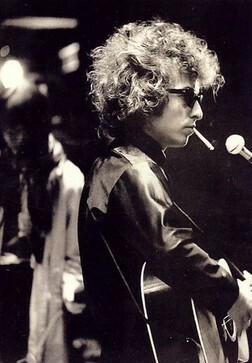 My absolute favorite singer of all time, hands down, without a doubt, no ifs ands or buts about it, is Bob Dylan. I love Dylan of the old, and Dylan of the new. If you have the audacity to ask, what my favorite Dylan song is… shame on you. Every student of Dylan knows, you can’t just have one favorite musical masterpiece. You can, however, have a favorite for every mood. Every obstacle. Every accomplishment. Anyone who has ever tried to write an article about Bob Dylan strings elaborate words into complex sentences to poetically describe the visionary. But, no one can write like Dylan. He is the greatest writer of our time. His lyrics don’t make sense to the vast majority of people, because they don’t take the time to listen. Hearing his scruffy voice can turn any sensitive ear away from the melody, but for those who appreciate his talent, listen very carefully to the message. Those people understand that everyday, is a Bob Dylan kind of day. Next Post I’m Alive, with so much life to live! Love him!!! I thought I had written this blog for a second;) Great music taste! !